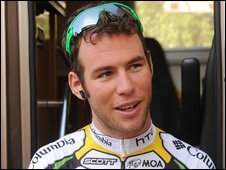 Mark Cavendish earned the 49th professional win of his career with victory in Saturday's second stage of the Tour of Ireland. The 24-year-old Manxman, winner of six stages in the Tour de France, won a sprint finish into Killarney. Yorkshire rider Russell Downing retained the overall lead for Candi TV going into Sunday's final stage. Seven-time Tour de France winner Lance Armstrong is in 20th place, 26 seconds off top spot. Downing leads Alexander Kolobnev by five seconds going into the final stage with the Russian's Saxo Bank team-mate Matti Breschel a further two seconds back in third. Donegal rider Philip Deignan is an impressive fourth - only 10 seconds behind Downing - while last year's overall winner, Italian Marco Pinotto is a further second back in fifth. Columbia rider Cavendish held off Rabobank rider Michael Van Staeyen and Stuart O'Grady in a mass sprint to clinch Saturday's win. The Olympian paid tribute to his team and said: "It's the first time I've gone really deep since July (in the Tour de France). "It's always good to win, and though it was a tough finish we managed to take control of things with two kilometres to go. "It was a team win, one guy crosses the line with his arms in the air, but it's a success for everybody." Armstrong played down his chances of overall victory in Sunday's final stage from Bantry to Cork City. The 122-mile stage ends with a circuit that includes three climbs of the steep St Patrick's Hill in the city. "It's a hard climb and there should be bodies everywhere," said Armstrong. "It's one of the few things I remember from when I last raced in Ireland in 1992. "If there are showers and the weather turns bad, it could be a tough day, a classic day. "I'll try and stay in the front but it won't be easy." Armstrong is using his last race of the year to promote his Livestrong cancer foundation. The seven-time Tour de France winner is competing for the last time with the Astana team and ends his season this weekend. Armstrong has not raced on the road since finishing third in the Tour de France behind team-mate and rival Alberto Contador.